BEAST is a British psychological thriver set in the small community of Jersey Island where the population are stuck and have nowhere to go unless they leave the island. It is beneficial to know a bit about Jersey Island in order to appreciate writer/director Michael Pearce’s film. The island is not part of the United Kingdom though the populace share a lot in common with the British including the currency of pound sterling The island is self governing though protected by Britain’s Military. The island lies between Britain and France close to Normandy. The island’s landscape is stunning, especially the beaches and rocky cliffs, much like Wales, west of Britain. Pearce’s plays his setting as a western, but a non-typical one. There is a scene where the local folks line dance. The film’s main actress is Irish and the actor South African. The story revives around Moll (Jessie Buckley), who is 27 and still living at home, stifled by the small island community around her and too beholden to her family to break away. Her over-bearing mother (Geraldine James) does not help Moll’s situation either. When she meets Pascal (Johnny Flynn), a free-spirited stranger, a whole new world opens up to her and she begins to feel alive for the first time, falling madly in love. Finally breaking free from her family, Moll moves in with Pascal to start a new life. But when he is arrested as the key suspect in a series of brutal murders, she is left isolated and afraid. Choosing to stand with him against the suspicions of the community, Moll finds herself forced to make choices that will impact her life forever. So far so good and the film works extremely well up to this point. It is the last third that Pearce’s film starts to fall apart, starting from the plot becoming too convoluted with a need for a plot twist, which does not take a genus to predict. If the last 10 minutes were removed and the film ended there, BEAST would have resulted in a much better film. The film benefits mainly from both the performances and chemistry between the two leads, Buckley and Flynn. Director Pearce makes good use of the film’s island setting with many of the key scenes shot on the beaches and cliffs. Geraldine James is also excellent as the overbearing mother. “Maybe I have been too soft on you.” She says. Or “Let’s be friends again,” after she gives Moll a good scolding. 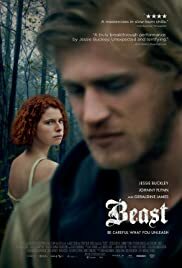 Besides its flaws, BEAST is a gripping film from start to end aided by the fact that it is true that everyone (in the film and in the real world) has a hidden beast on their inside.